HYDROMAX® is the cost-effective, compliant solution for collecting aluminum, titanium, magnesium and other volatile dusts in highly combustible operations. HYDROMAX® Wet Collectors offers the most technologically innovative design available in the industry today. Competitors may offer all stainless steel construction, TEFC wash-down motors and / or NFPA compliant packates as expensive add-on options, while Micro Air® has built all of it into the standard product offering. Combustible dust enters the HYDROMAX® wet collector through ducting in the rear of the filter cabinet and is run through a series of internal baffles, utilizing engineered water streams to drop out and filter the combustible dust. 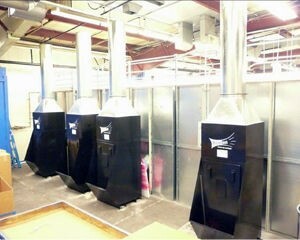 Dust is contained in the bottom of the collector for safe removal at necessary intervals. Water levels are automatically controlled through the Micro Air® engineered flow valve system that can be interlocked with the dust producing equipment to meet OSHA and NFPA codes. HYDROMAX® is the cost-effective, compliant solution for collecting aluminum, titanium, magnesium and other volatile dusts in highly combustible operations. 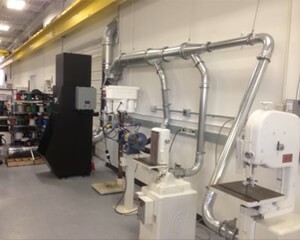 Versatility is key as collectors can be ducted to individual operations, ducted to multiple workstations for a central collection system, or ducted to the WCDDT downdraft table for a self-contained workstation to immediately draw dust directly into the water filter system and thereby reduce the risk of fire. Engineered into the HYDROMAX® collector design are versatility and safety...providing the OSHA / NFPA compliant collection method for operations where there is risk of combustion. Metalworking manufacturers who work with aluminum, titanium or magnesium have become a target for OSHA enforcement under NFPA 484 regulations. Micro Air® WC1200 wet collector is the OSHA / NFPA compliant solution for collecting combustible particulate generated in grinding / buffing process in aerospace plant. 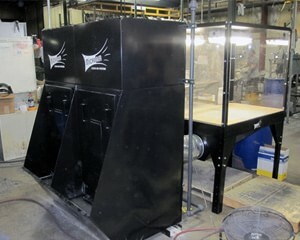 Micro Air® WC2500 attached with hood direct to processes inside process booth enclosures. 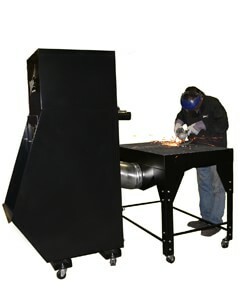 Utilizing a water-filter system to collect aluminum, titanium, mixed metal and other volatile dusts, Micro Air® wet collectors can be configured with a downdraft table ducted to the collector, creating a self-contained workstation to immediately draw dust directly into the water filter system and reduce the risk of fire or explosion. HYDROMAX®...Micro Air's line of wet collectors provide the economical, simplified solution to dust collection in applications where there is risk of deflagration of explosion. 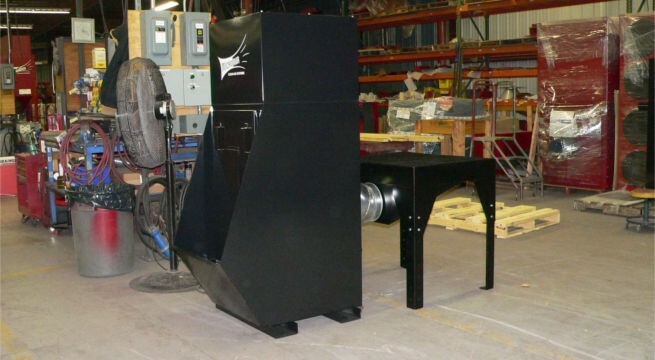 Ducted directly to an industrial operation or to a WCDDT (Downdraft Table), the HYDROMAX® wet collector captures aluminum, titanium or other volatile dust at the point where it is generated, drawing the particulate into the water-wash system. The HYDROMAX® series provides OSHA / NFPA compliant, source-capture of volatile materials without the addition of costly components required with traditional dust collectors, ie. explosion vent, backblast dampers, fast acting valves, chemical isolation.